This high performance, water-based epoxy/acrylate provides outstanding durability, abrasion resistance, and high gloss retention without the toxicity and disposal considerations associated with some solvent systems. Seal II also displays superb resistance to a wide variety of chemicals and solvents commonly found in industrial and commercial environments. When cured, Seal II exhibits characteristics superior to solvent based urethanes and rivals those of solvent based epoxy coatings. 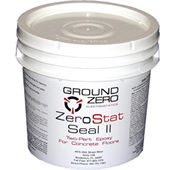 Seal II produces superior results when used on a broad range of concrete and ceramic surfaces. » Why use an ESD floor finish?